​Paraguay is the third poorest country in South America. Of its 6,340,000 inhabitants (2011), more than 35 percent lives in conditions of poverty and nearly 20 percent in extreme poverty, earning less than US $1 per day. In Paraguay, thousands of farmers and indigenous families have been expelled from the land through corruption. More than 85 percent of the land parcels greater than 500 hectares (1,235 acres) are owned by just 2.6 percent of landowners. This polarization of land tenure is accentuated year after year and directly relates to the pervasive poverty. The opportunities available for the poor youth of Paraguay are extremely limited due to necessities at the home, inadequate public schooling, and limited healthcare. Geography: California-size Paraguay is surrounded by Brazil, Bolivia, and Argentina in south-central South America. Eastern Paraguay, between the Paraná and Paraguay Rivers, is upland country with the thickest population settled on the grassy slope that inclines toward the Paraguay River. The greater part of the Chaco region to the west is covered with marshes, lagoons, dense forests, and jungles. Tobati is both a town and a provincial district within the department (state) of Cordillera, Paraguay. The population of the district of Tobati is 21,315 (2009) of which 16,538 (75.5%) are under the age of 19. 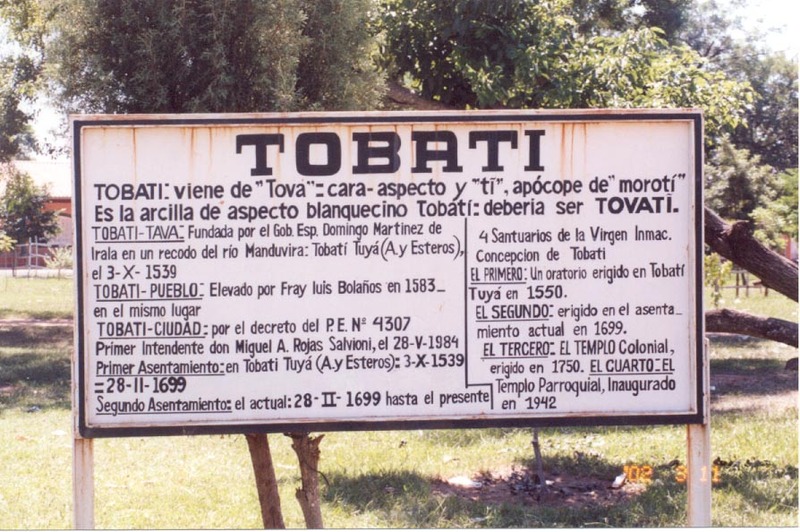 Tobati is situated 70 kilometers to the east of Asuncion and 10 miles north of Caacupe. The town of Tobati is made up of 15 neighborhoods or barrios while the district includes an additional 22 rural communities or compañías. The 15 barrios are San Miguel, San Antonio, San Francisco, San Jose, Virgen de Fatima, San Roque Gonzalez de Santa Cruz, Santa Teresita, Virgen del Rosario, San Pedro, Santa Lucia, San Blas, Villa Artesanal, Villa Jazmin, and Maria Auxiliada. The 21 compañías are Potrero "Zona" A, 21 de Julio, Potrero "Zona" B, Santo Tomas, San Rafael, 4 Viento, Santa Rosalia, Punta del Este, Villa de las Mercedes, Mompox, Santa Rosa, Ensenada, Loma Verde, Costa Alegre, Capitan Caballero, Isla Florida, Aparypy, Santo Domingo, Rosado, Jhuybaty, Isla Guazu, and Santa Rosa. ​A significant percentage of the houses in Tobati the region lack running water and electricity. This poverty is especially prevalent in the region's rural villages, known as compañías. Most men and boys in the region work in small brick or tile factories that pay only a few dollars per day. A large number of girls work as domestic servants. Schools run in three or four hour shifts in order to allow for children to work and also due to overpopulation and a lack of resources in the local schools. Tobati's small medical clinic, like all public healthcare facilities in Paraguay, struggles with a lack of federal funding and a shortage in basic supplies and medicines. The people of Tobatí in large part cannot afford to purchase medicine or travel to hospitals in the cities for better care. Malnutrition and parasitosis are common amongst the region's rural poor. Due to economic challenges and inadequate schooling, very few students from this region are able to finish high school. Very few go on to college in Caacupe or Asuncion. Through the Macchi School, Team Tobati is able to offer poor Tobati students a top notch college preparatory education along with free healthcare and access to medicine. The Macchi School is changing the destiny of Tobati students each and every day.